This piece of the 1897 USGS topographic map shows the Thorn Road running from the lower left to the lower right corner. There are a few things to point out. 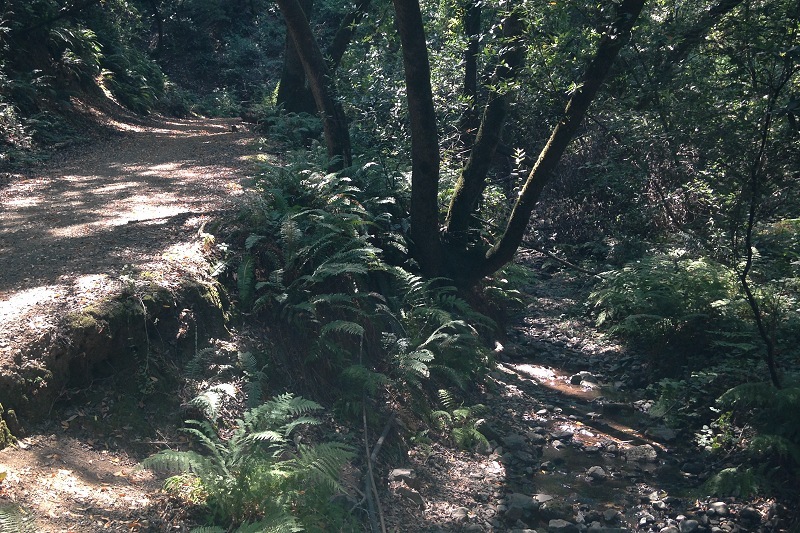 Kohler Creek is called Temescal Creek today, but back then Temescal Creek went straight uphill from the Lake Temescal reservoir. 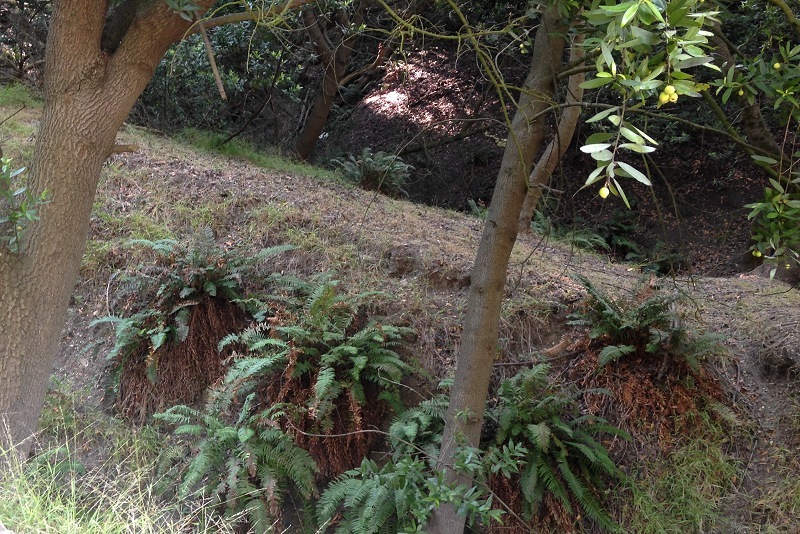 That streambed was obliterated by the later construction of upper Broadway, Route 24 and the Caldecott Tunnel bores. 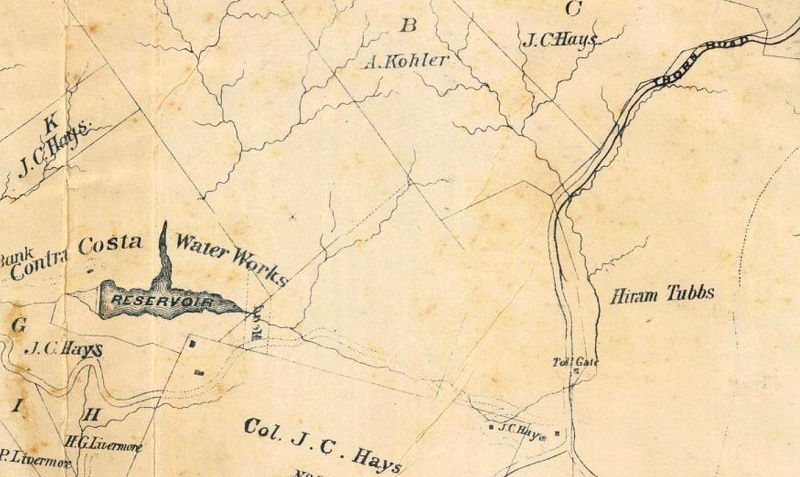 The dashed line from top to bottom is the county boundary, and the thick dot-dot-dash line running up the canyon along with the road is the boundary between Vicente and Antonio Peralta’s shares of the San Antonio rancho, the immense royal land grant made to their father in 1820. 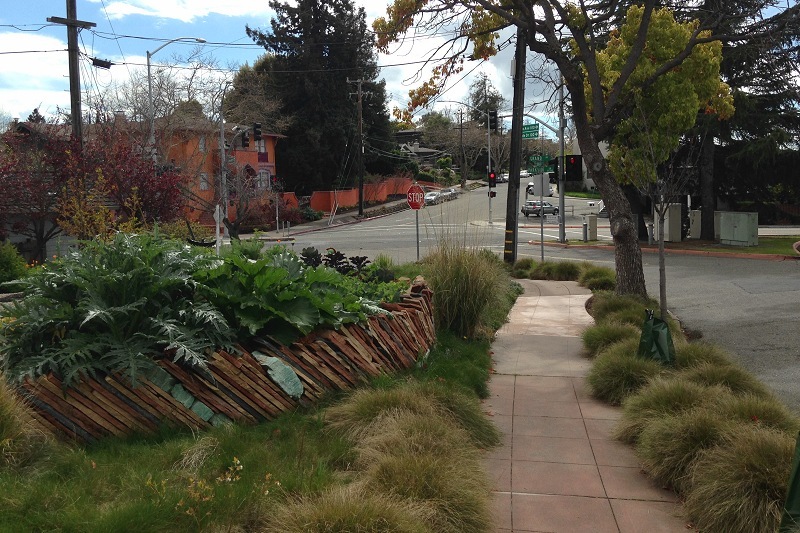 The Thorn Road was also the official line between the Oakland and Brooklyn Townships of Alameda County. This 1878 map made by Malcolm King shows the landmarks at the time, including the location of the toll gate about where the Thornhill Coffee House stands today. In the 1880s it was already being referred to as “the old Thorn road.” In 1889 the Tribune reported on the Alameda County Board of Supervisors meeting of 1 April: “The Committee of the Whole, to whom had been referred the petition asking for the placing in good repair of the Thorn road to Moraga valley presented a report saying, that upon examination of the ground, they were satisfied that it would be utterly impossible to ever make the same a good road on account of the steep grade.” They recommended surveying “a road to the summit over a new route and on an easy grade.” That new road was the Snake–Skyline–Pinehurst Road route. 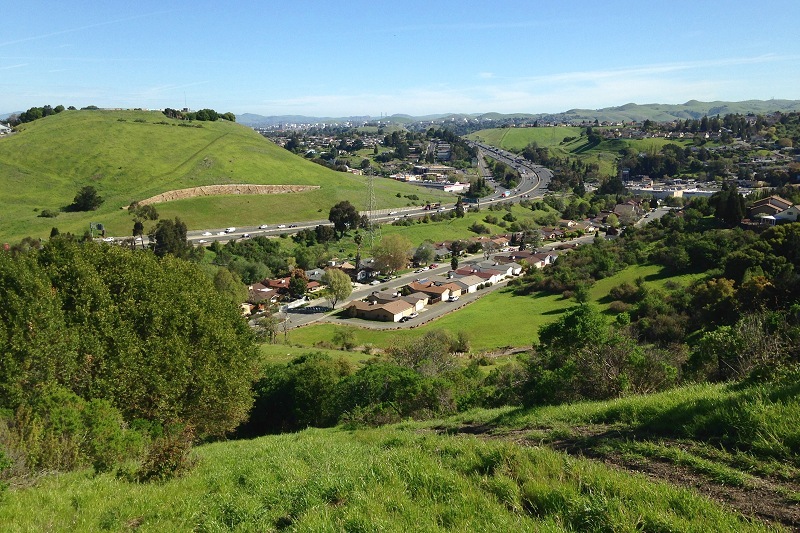 Between it, the existing Redwood Road, the Kennedy tunnel to the north and the Oakland Antioch & Eastern railway to the south, which went up Shepherd Canyon and cut through the hills to Eastport, the Thorn Road was no longer the best way over the hills. 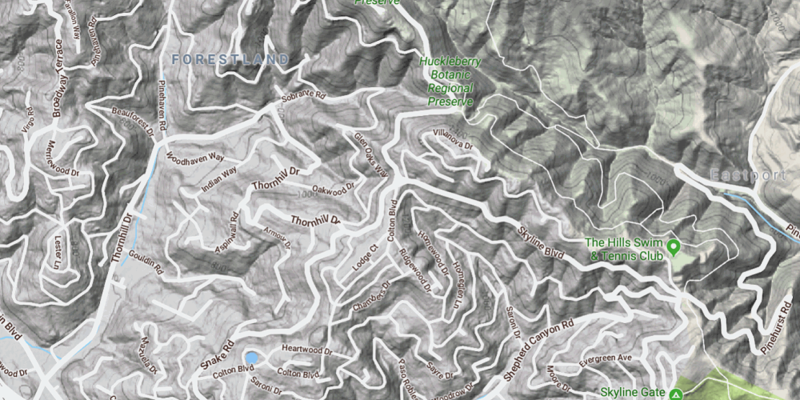 Nevertheless, the 1936 street map showed Thorn Road still following its old route up to the Huckleberry saddle. 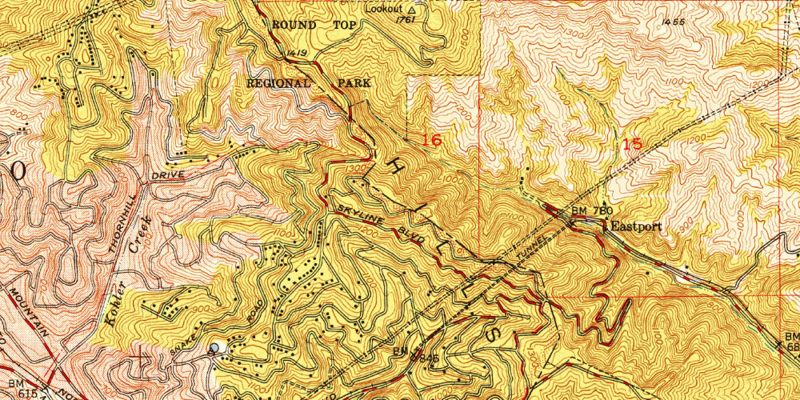 The 1947 topo map shows that the top segment of the Thorn Road, and all of it on the far side, had been abandoned. 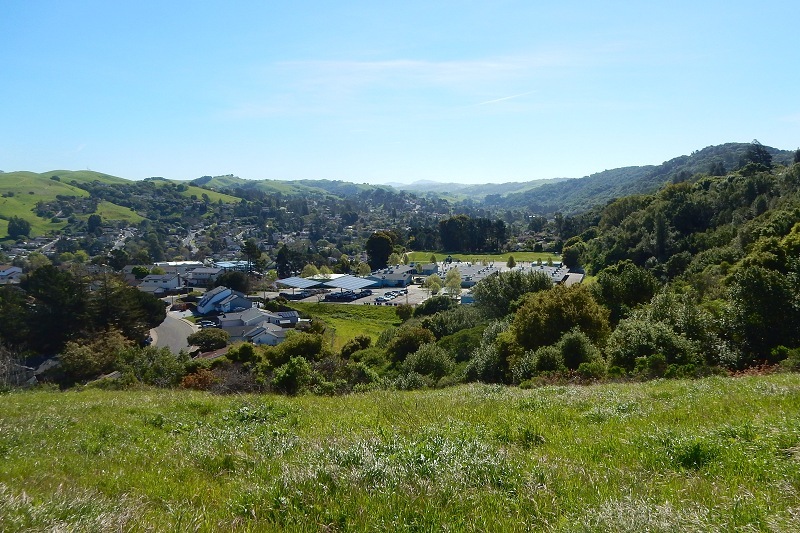 The newly named Thornhill Drive took a zigzag route incorporating what had been Idlewild Drive, and the part of the Thorn Road left behind was named Sobrante Road. Here’s the modern Google map just to give an idea of the streets and terrain. The Thorn Road took the gentlest way up Thornhill Canyon to the topographic saddle where the entrance to Huckleberry Preserve is today. It was still a very challenging grade near the top, about a 36% grade or 20 degrees, according to my phone compass. 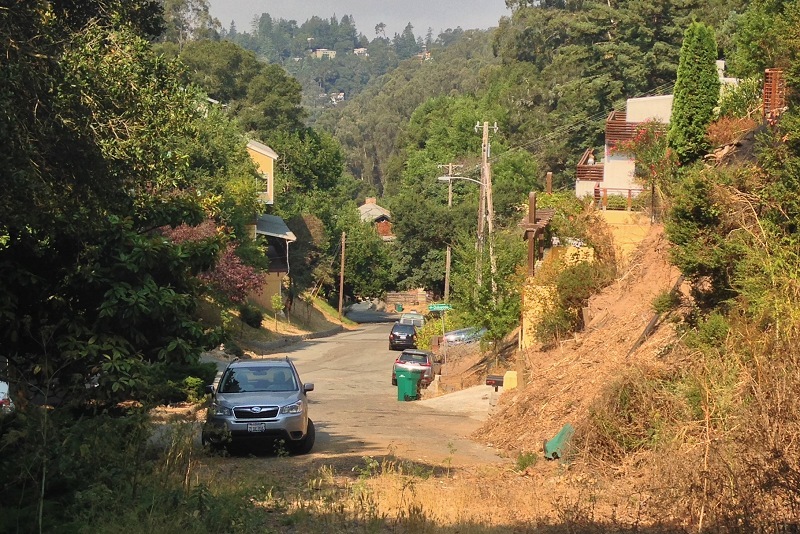 (This would rank among the steepest streets in notorious San Francisco.) It was even steeper on the Contra Costa County side. 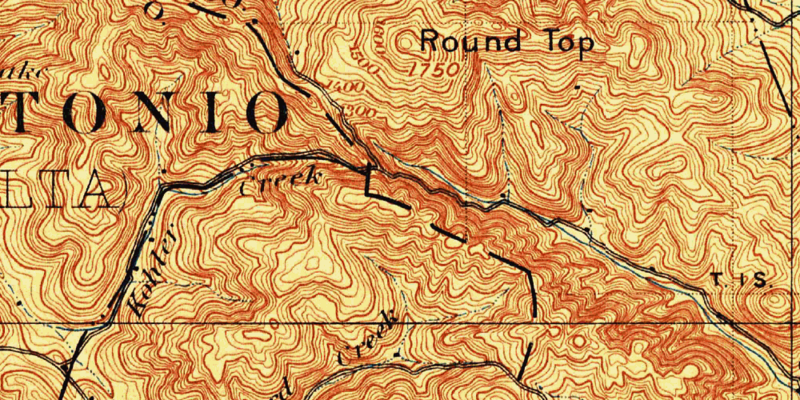 For a while after the 1947 topo map was published, street maps connected Sobrante all the way to Skyline, but as of 1967 the upper end of Sobrante had been cut off. However, there’s still a right-of-way and a sewer line running down it. That’s where I took a walk last week. This is looking back at the end of Sobrante and across Thornhill Canyon. There are remnants of the old grade, but no path bigger than a game trail. I think a footpath should be built here, as an emergency route if nothing else. Underfoot is Claremont chert, not a surprise because this is right next to, and a hundred feet downhill from, the endangered chert roadcuts of Elverton Drive. The habitat has possibilities. The ground was wet during my visit, thanks to fog drip. 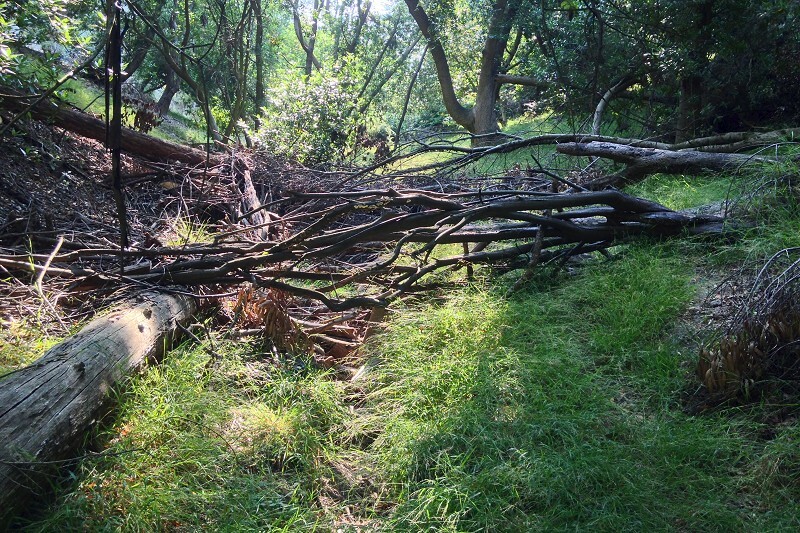 But crews have dumped a bunch of eucalyptus slash, which not only obstructs passage but also presents a fire hazard. 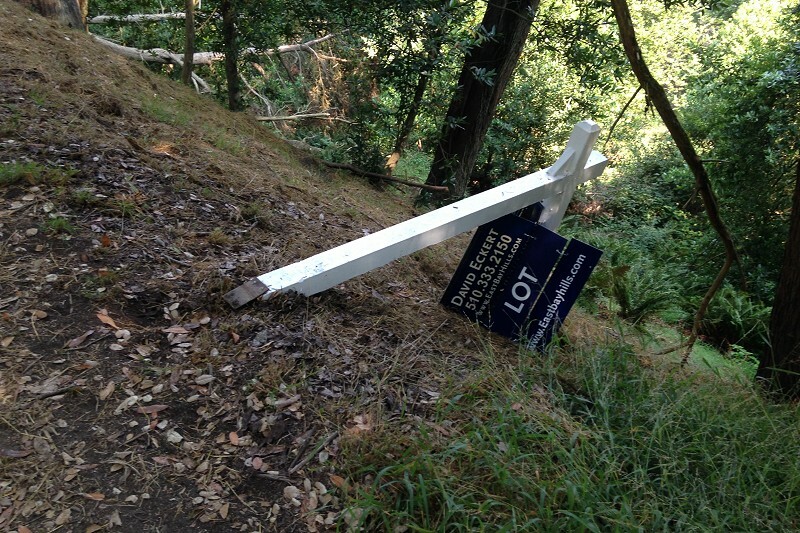 Also prominent in the human litter is a bunch of slash consisting of For Sale signs. There are still lots available up here. On the far side of the ridge, in Contra Costa County, a stub of the Thorn Road got the name Winding Way. It was known as a shortcut for motorcylists when CHP Captain George Kallemeyn, chasing a group of hotrodders down the road, went over the edge and died in July 1959. Winding Way was still shown as open as of 1967, though it went only a short distance down the canyon. Some time after that a landslide took out the highest segment of the road, and today the Huckleberry Path edges around the scar. About a hundred yards down the trail, a bench marks the spot where the old roadbed, heavily eroded and overrun in roadcut rubble, picks up again. It’s passable on foot all the way down to the hairpin turn of Pinehurst Road. I recommend visiting this end of the old road starting down at Pinehurst. You can park beside Pinehurst a little bit downhill from the hairpin, where the old rail tunnel came out. (The cut is still there, filled with rubble and leaking a steady stream of groundwater.) 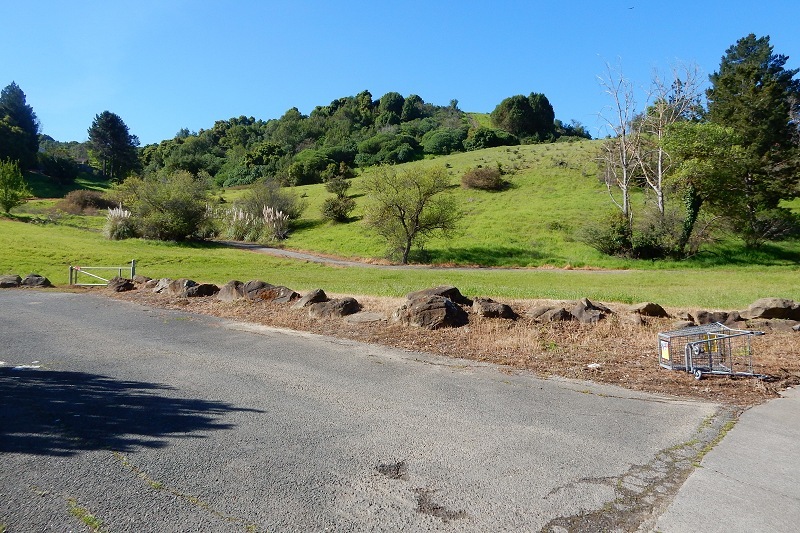 But just as convenient, and more tempting, is the new Wilcox Station staging area, an access point to Sibley Volcanic Preserve’s eastern annex where the Eastport station once stood. 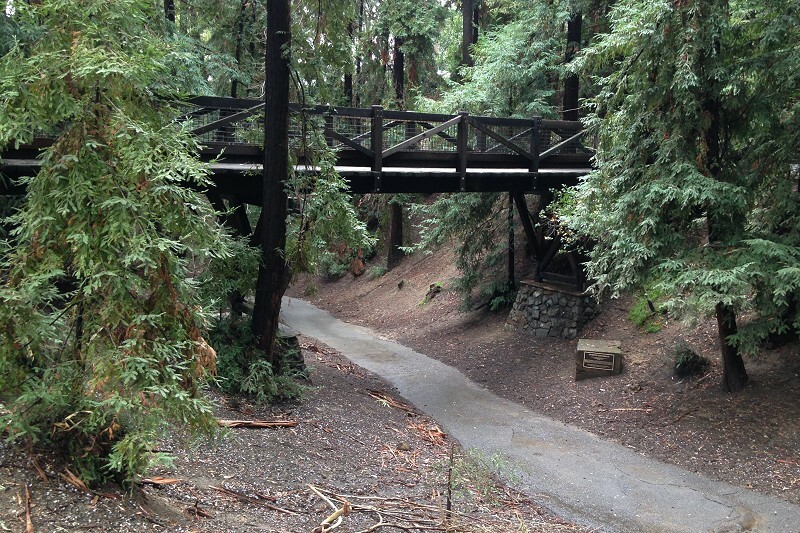 The road starts out along San Leandro Creek, then soon starts to climb. It’s a steady grade, but the road was never more than one lane wide. 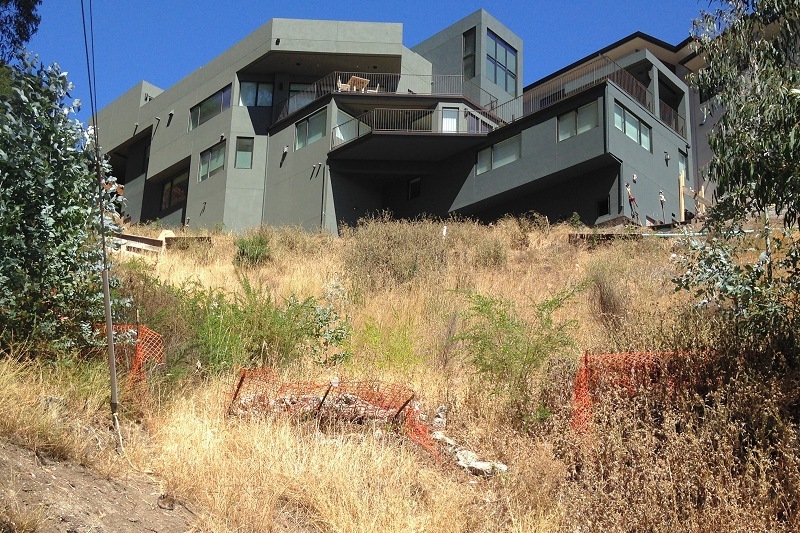 As you walk it, imagine the work it took to trailblaze by pickaxe and oxteam. Imagine driving the daily stage to Danville over it. 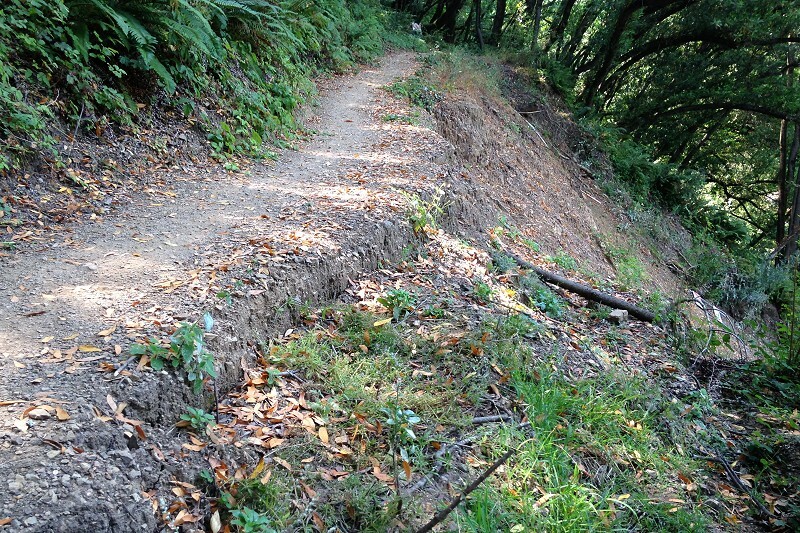 Between raveling ground on the uphill side and landslides on the downhill side, this road, once a vital link in the commerce of the redwood era, is reduced to a precarious trail today. 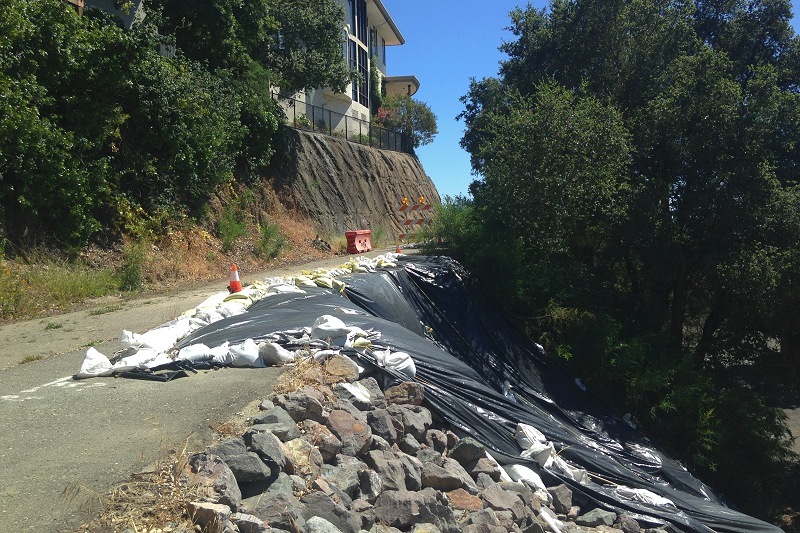 At any time an earthquake or rainy winter could cut it off, either until repairs can be made or once and for all. This stuff, as seen a few weeks ago during a return visit. 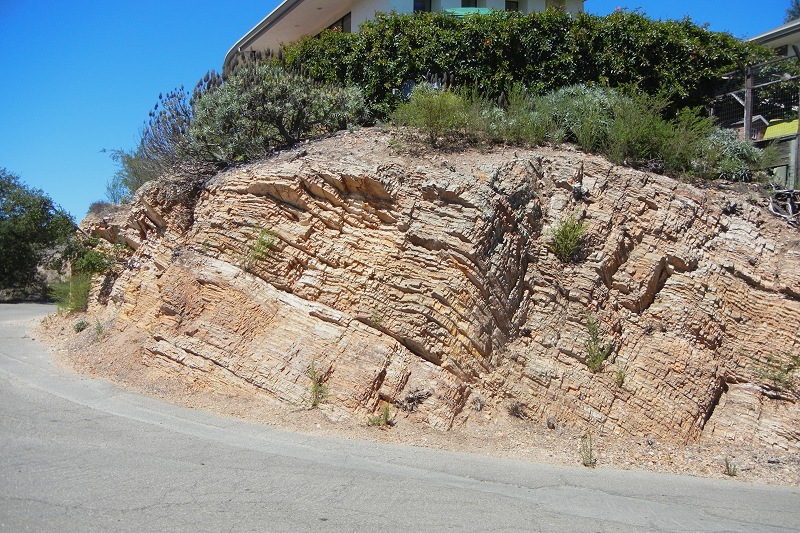 Those of you who’ve followed along know the amazing striped chert of the Claremont Shale, which crops out in a belt from Claremont Canyon along a couple miles of Skyline Ridge to Huckleberry Botanical Preserve and beyond in the hinterland. 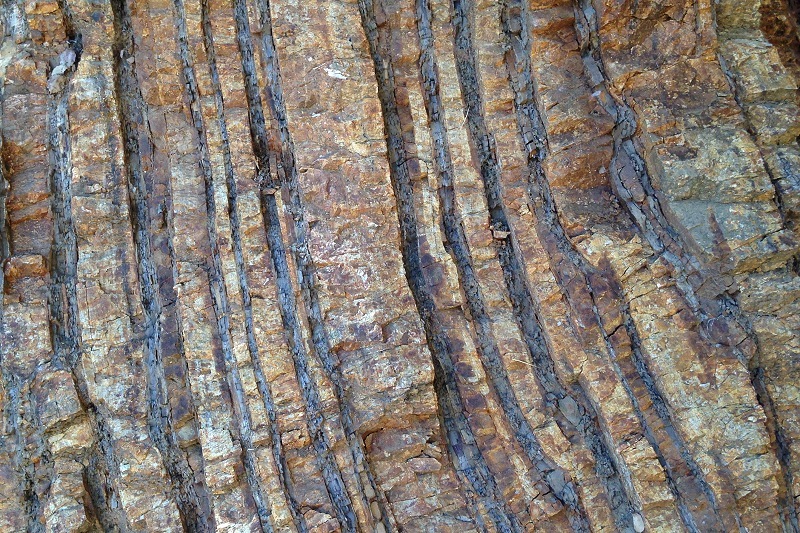 The fat pale stripes are layers of microcrystalline silica — chert — and the thin dark ones are layers of claystone — shale. During this visit I walked from the south end of Elverton past the newest set of houses, near Huckleberry, and had a good stop in the old borrow pit. The wall has crumbled a bit since five years ago, opening this fine exposure. 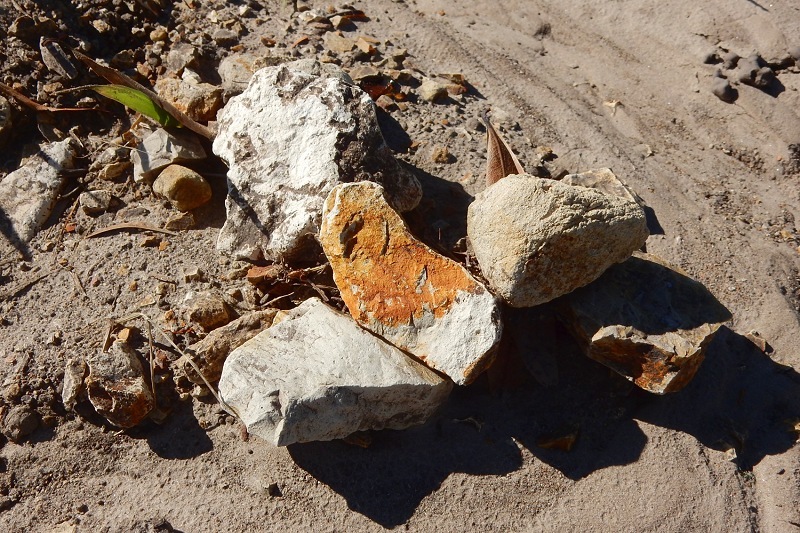 I was hoping to find pieces of dolomite rock, which are present as an uncommon third ingredient, so I gave the rubble a good look. 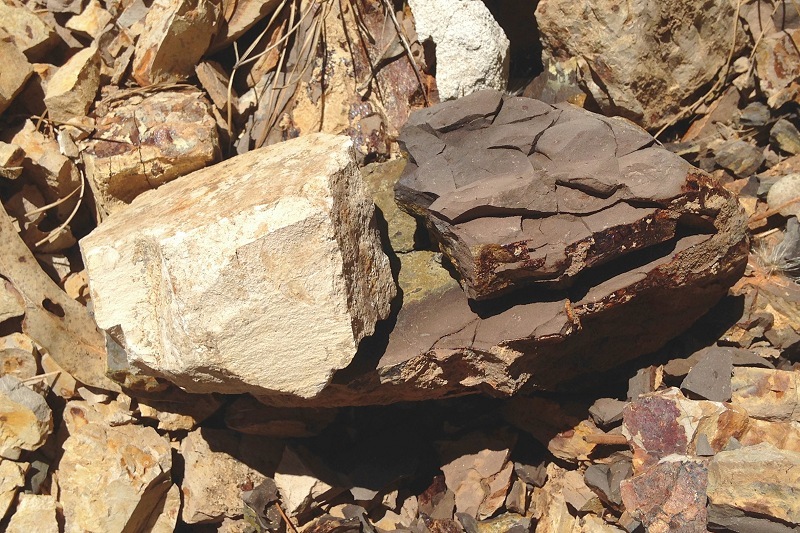 None of that there, but I was interested to see some extra-thick pieces of the chert and shale. The chert, in fact, was very light. It was barely changed from its original state as diatom ooze on the seafloor, almost the balsa-wood lightness of the Pinole diatomite. I did not expect that. 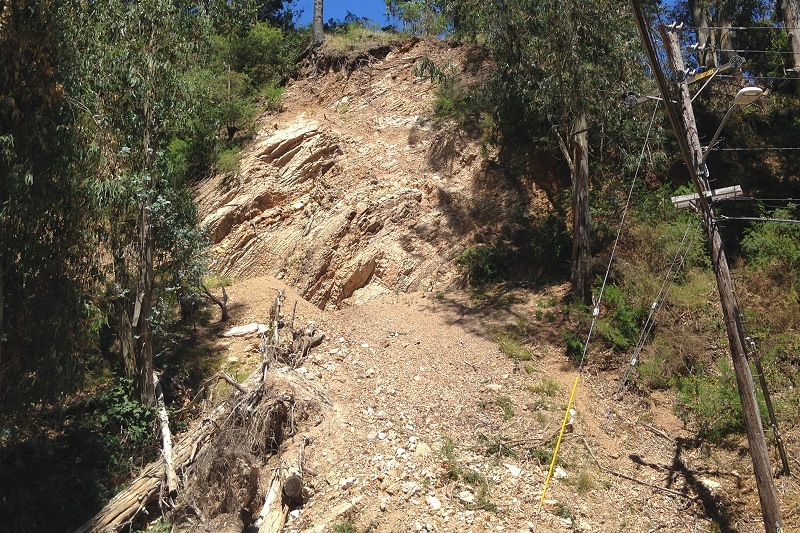 Every time I visit the high hills, the pleasure of geologizing gives way, sooner or later, to a sense of dread at the state of the roadcuts. 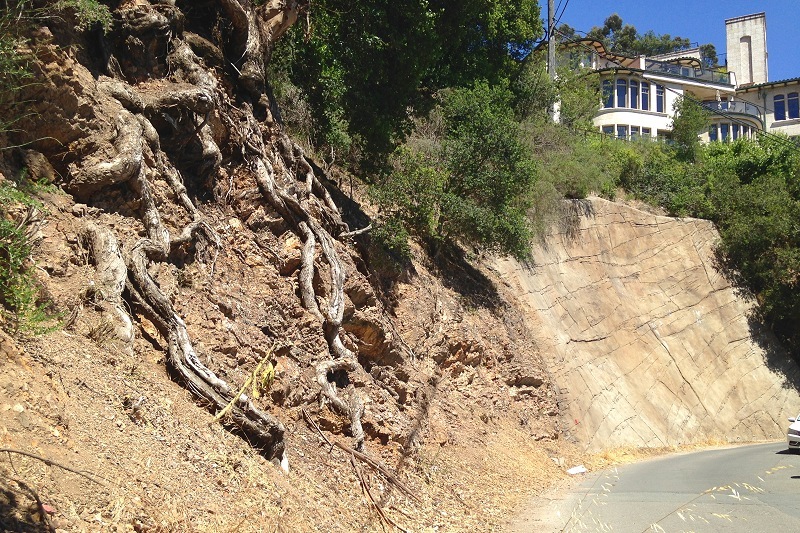 The eucalyptus roots in this scene were exposed as the hillside crumbled away, and behind them is a concrete cast meant to slow down a landslide. But thinking ahead I looked forward to admiring this again after five years away. Google Street View still shows it. 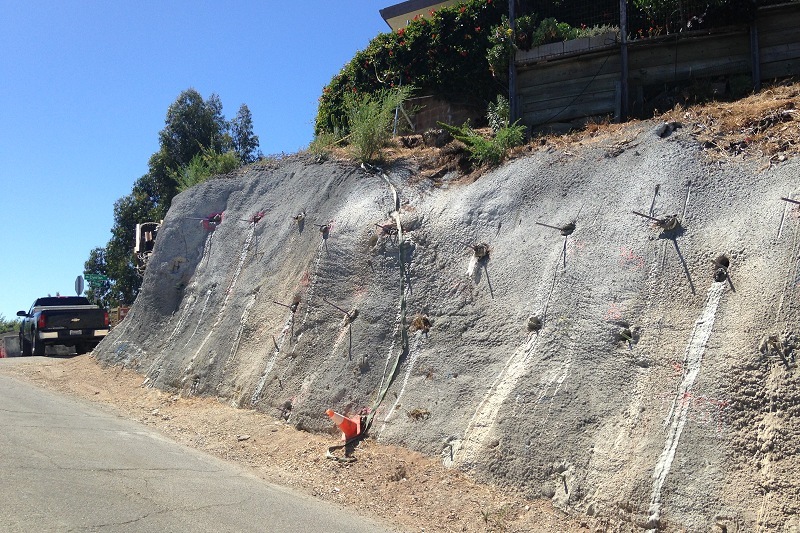 Instead, it’s being shored up and fitted with a shotcrete shroud. And another splendid exposure farther along is being smothered too, with no finesse. In fact, not long afterward I started to despair of Elverton Drive. Is this the point of occupying such a spectacular setting? To cover it with property? To look outward and not downward? 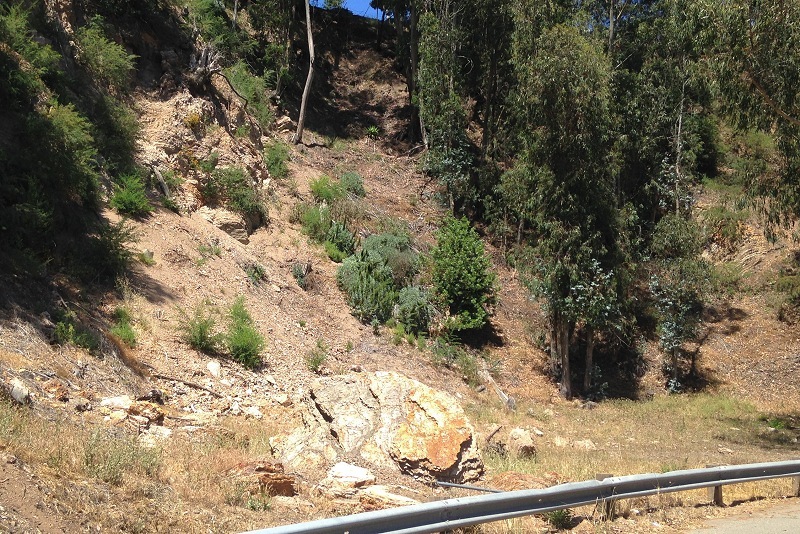 The Claremont chert isn’t as solid as it might seem. Given the tendency of these young rocks to crumble, there’s no guarantee a new house in the high hills will survive its first mortgage. Or that the road will last that long. Look out. Don’t look down. Elverton Drive is falling apart while it’s still filling up. I already miss the place. The western end of Piedmont includes the headwaters of Pleasant Valley Creek, which is tucked under Grand Avenue. But the slopes and gullies of the valley can’t be hidden, and what may seem like a scramble of streets is a nice place to walk around. 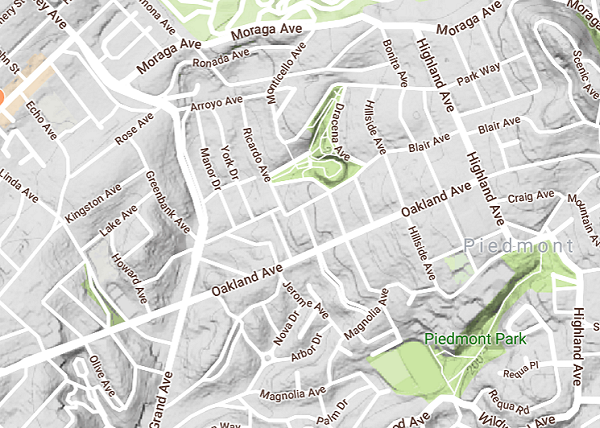 The topography I’m talking about is north of Oakland Avenue, between Grand and the former quarry of Dracena Park. None of it’s bedrock; nothing wrong with that. 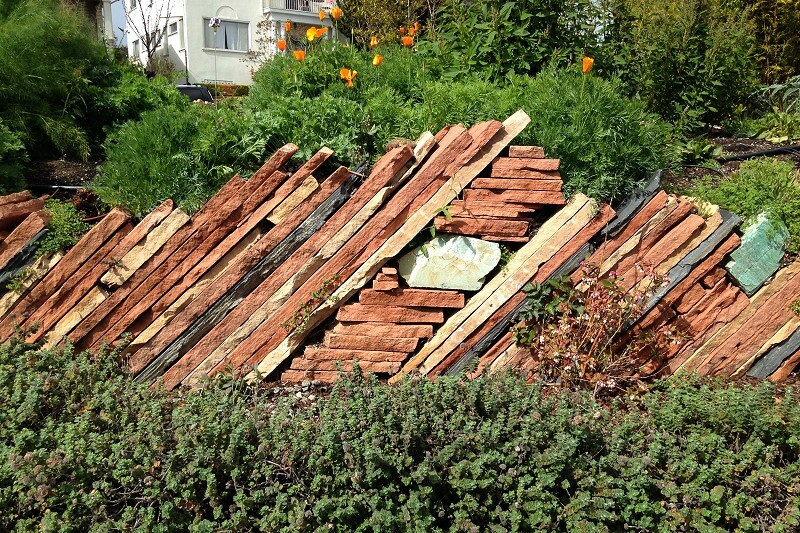 It’s the uppermost part of lobe 3 of the Fan, that big arc of ancient alluvium hills across central Oakland. 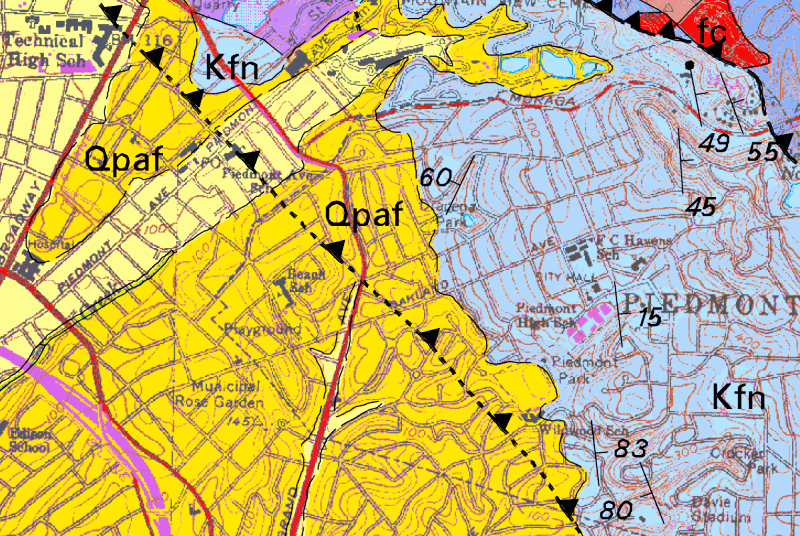 The bedrock part, farther uphill, is much steeper walking, and the rock (the blue field labeled “Kfn” on the geologic map) doesn’t show itself either. or in the valley on the north side, now full of redwoods. This is the most dramatic bit of stream valley in the area. Elsewhere, it’s easy to trace the drainage lines; in fact during our recent batch of rain, you could see water coming out of the ground just like in the old days before people lived up here. This slopy bit of suburbia is criss-crossed with hidden history. The Key System streetcars used to serve the neighborhood. Indeed, a railroad syndicate once planned a major route through here that was going to run through upper Fruitvale and on to San Jose. The right-of-way appears in this 1927 map (courtesy of the Oakland Library History Room), long after the plans were abandoned. The part of it running as far as Oakland Avenue did end up with rails as part of the Key System’s C line. If you look closely at the area in Google Maps, the lot lines give the route away. The transit routes, road and rail, took advantage of the saddle in the ridge of lobe 3, at this spot where Pleasant Valley Road eases over the hill and becomes Grand Avenue. The view is west across the saddle toward Rose Street. OK, enough of that. 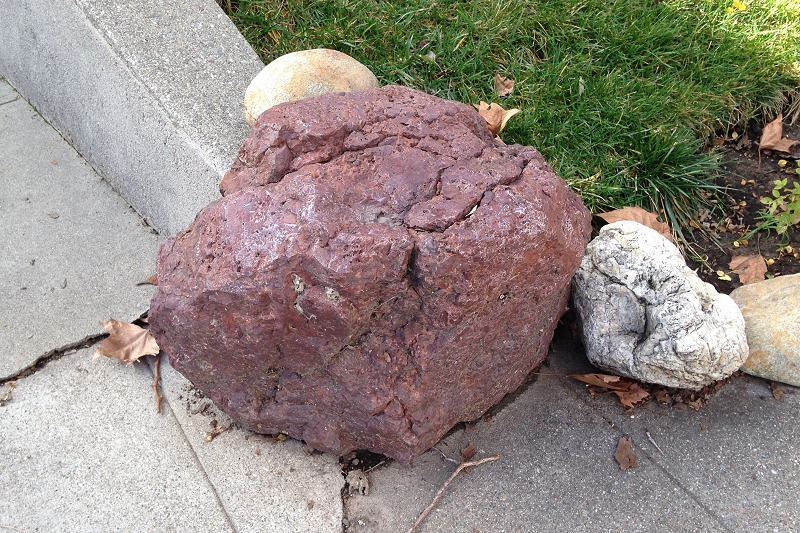 There are indeed rocks in this neighborhood. See that clever stone wall in the foreground in the previous shot? Here’s a closeup. 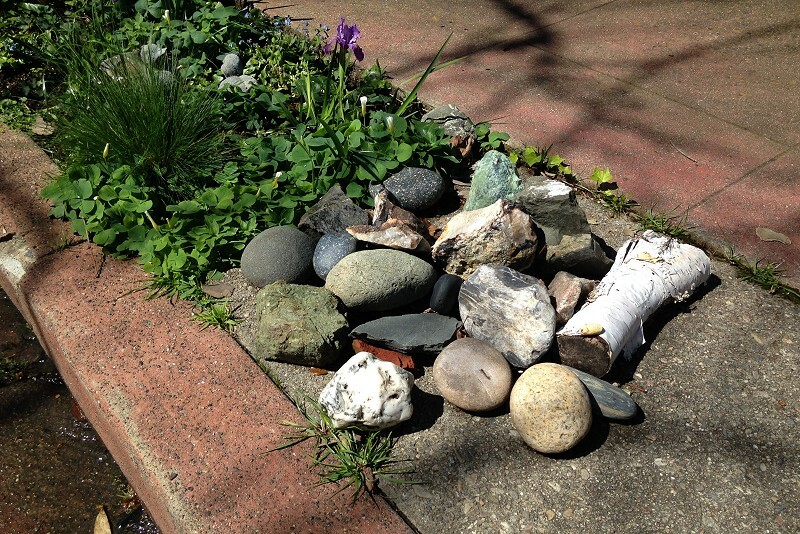 Other rocks are more laid back, understated but cool. Still others, the only word for them is homey. 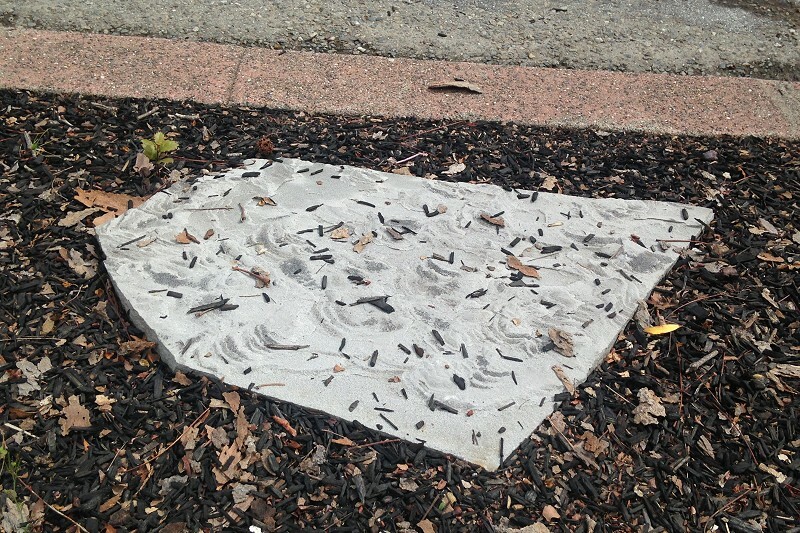 They’re all mostly landscapers’ stone, purchased at a commercial yard. But here and there you’ll see genuine domestic Oakland rocks. 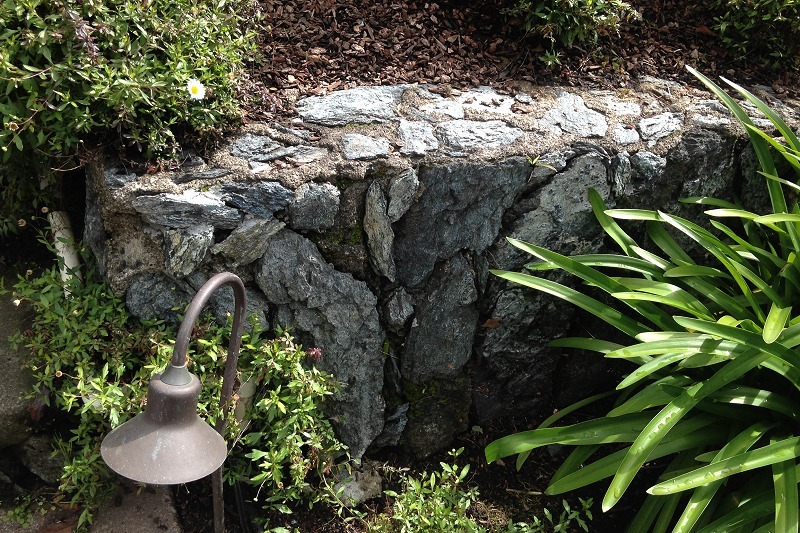 This little wall is made of serpentine/blueschist from around here, probably the pit at Serpentine Prairie or nearby. 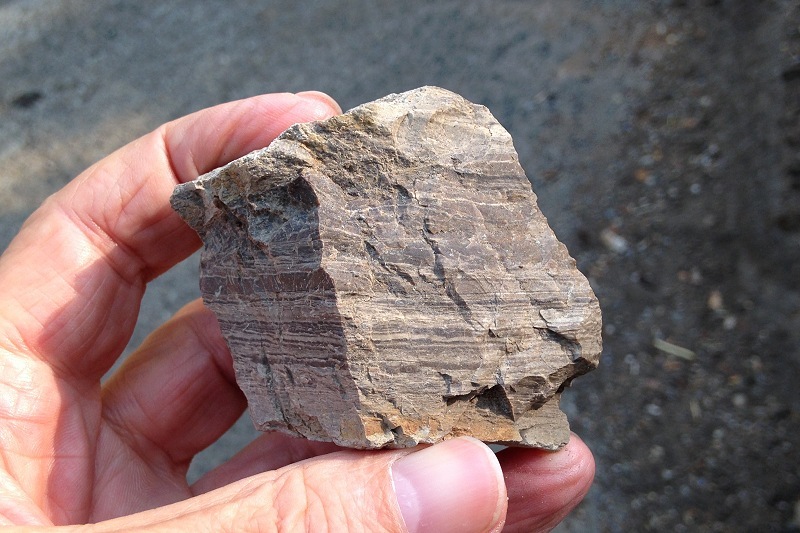 And the Franciscan red chert is very likely from Piedmont itself, which sits on a hill of melange, a marble-cake rock unit that mixes chert, basalt, sandstone and serpentine in a mudstone matrix. Some of it can be downright psychedelic. Stuff like this was quarried in Piedmont before any buildings were here at all. 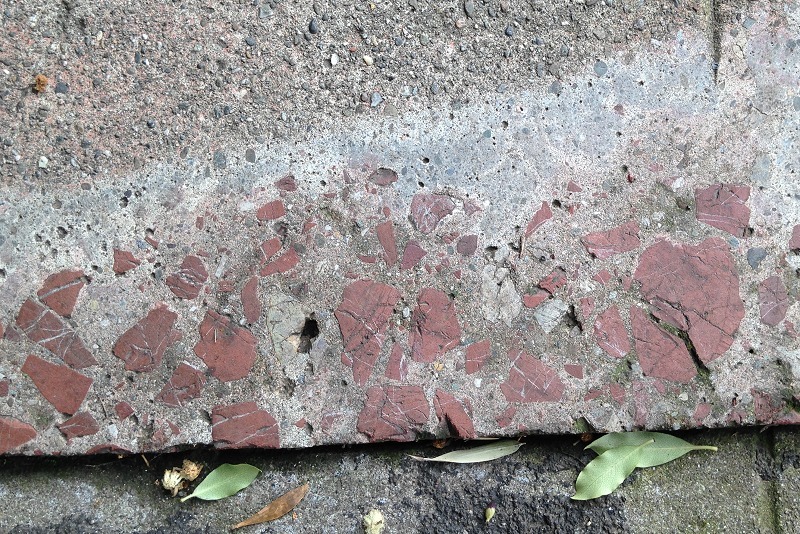 Even the sidewalks, the oldest ones anyway, incorporated aggregate from Piedmont’s original quarries. The town has grown up since then. It puts on a good front — very nice homes, lovely grounds, a fine place for walking and taking in the views (especially when the leaves are down in winter). But it began as a rugged, dusty mining district with horses and dynamite. 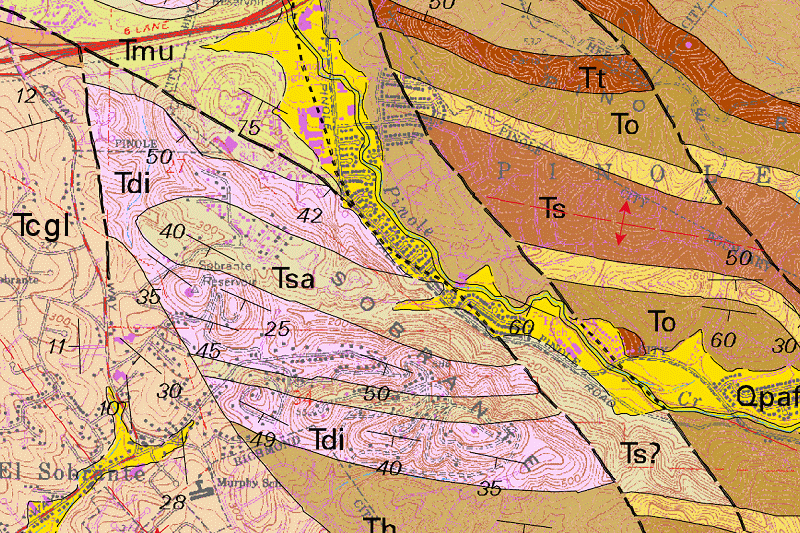 The geologic map I rely on for this blog — U.S. Geological Survey map MF-2342 — extends north to Pinole, where it shows this little pod of rocks labeled “Tsa” and “Tdi” between Pinole, El Sobrante and Richmond. 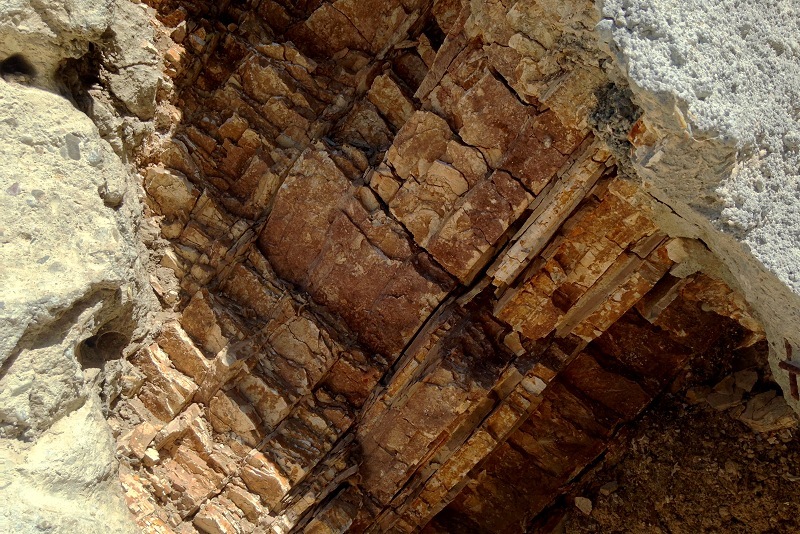 Both units are of early Miocene age: Tsa stands for sandstone and Tdi stands for diatomite. The T stands for Tertiary, the catch-all term for Cenozoic rocks older than Quaternary, which — OK, you don’t need the whole lecture just now. 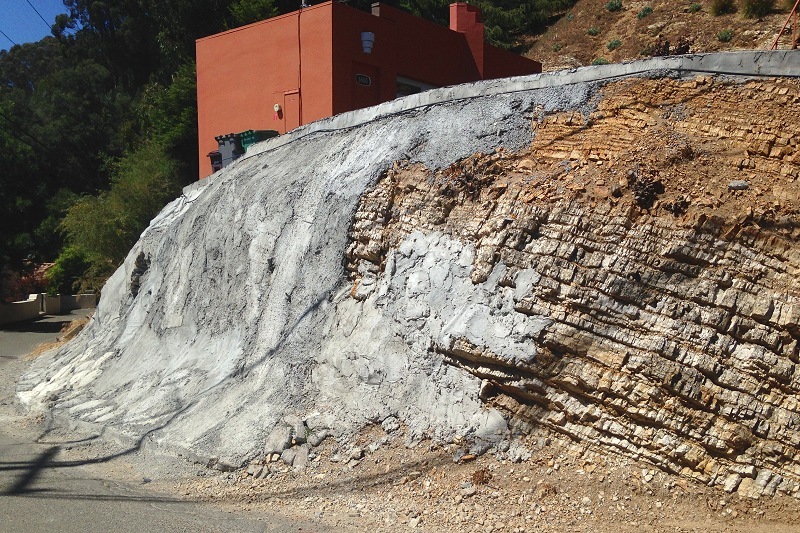 The point is, I had to go see this diatomite because I didn’t know it existed in the East Bay. 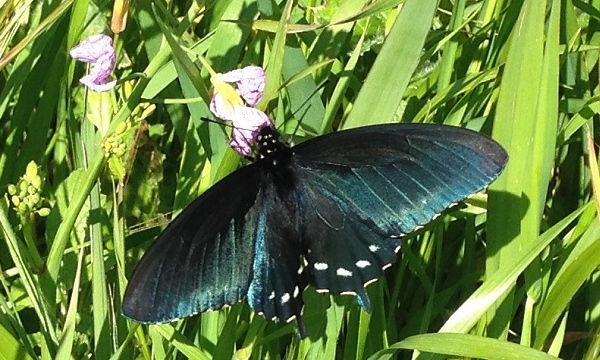 I’ve seen it in the Central Valley, but never around here. Going north on I-80 you take the Appian Way exit right and immediately turn left on Sarah Drive. 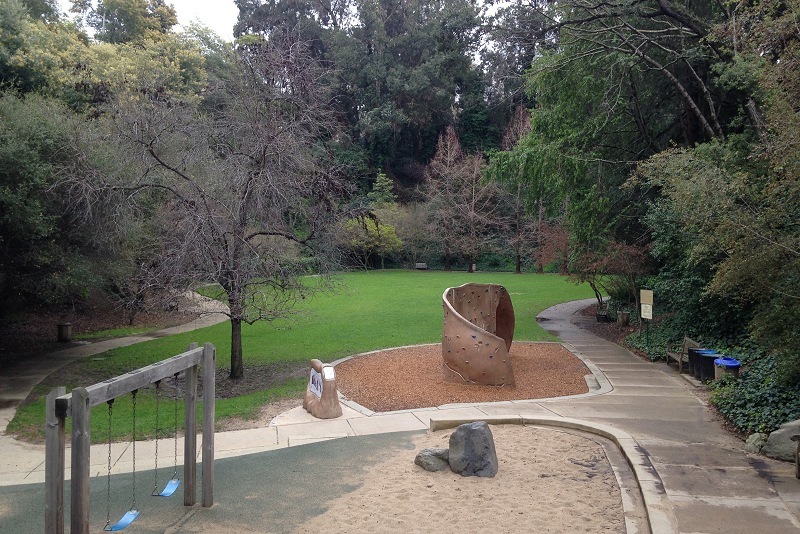 Down at the bottom of a valley is Pinole’s little, undeveloped Sarah Drive Park. On the way to the hilltop, you start seeing this odd rock in the road. Pick up a piece and you’ll find it’s very light. That’s the diatomite. The trail becomes very steep, exposing the bedrock. The hilltop affords nice views. I was especially taken with the view north. And the view east looks up Pinole Valley toward Mount Diablo on the horizon. If you’re riding toward Sacramento on the Capitol Corridor Amtrak train, there’s a moment just east of Point Pinole where you can catch this same view of the mountain. So that’s all great. But here’s what’s cool about the diatomite. Diatomite is composed of diatoms, the microscopic algae that make shells of silica. As an industrial commodity it’s also called diatomaceous earth, or DE, or kieselguhr if you’re feeling smart. As the stabilizing agent for nitroglycerin in dynamite, it made Alfred Nobel’s fortune, and that’s why we have the Nobel Prize. 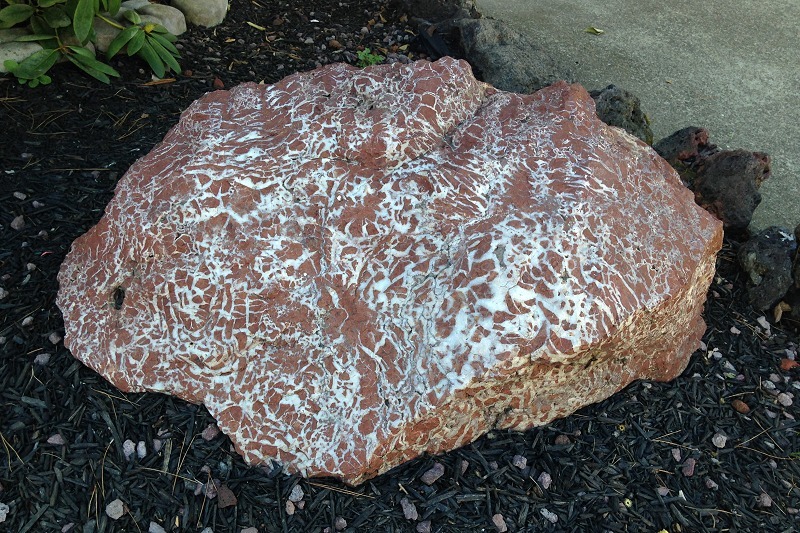 As its silica content slowly turns into the crystalline mineral quartz, diatomite becomes the rock called chert. 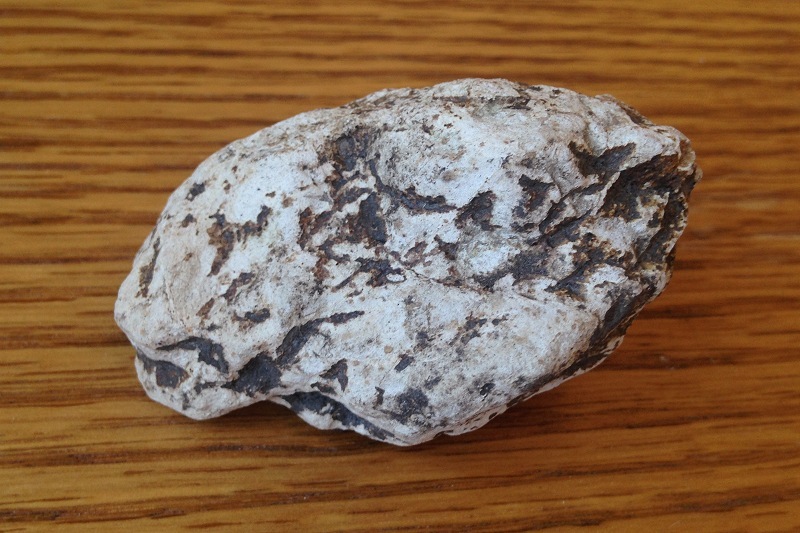 As it happens, the Pinole diatomite is about the same age as the chert in Oakland’s Claremont Shale. By some tectonic accident, it avoided being converted, and you can enjoy its lightweight charm without a trip to Los Banos.